Thinking About A New Wetsuit? | Mediterra - Swim & Run Better Than Ever! Thinking About A New Wetsuit? I want to lay out some thoughts about buying a wetsuit to address the many questions and concerns I receive. Much of the following is an excerpt from my forthcoming ebook A Better Triathlon Swim that is just days away from being published. Wetsuits are desirable for triathlon swims, open water races, and for recreating in cooler water. And, I suppose some want to wear them because they look and feel like a super-hero costume! If the race permits and the wetsuit allows you to participate in cool water that would otherwise be too cold for you to enjoy, then this is a good use of the wetsuit. 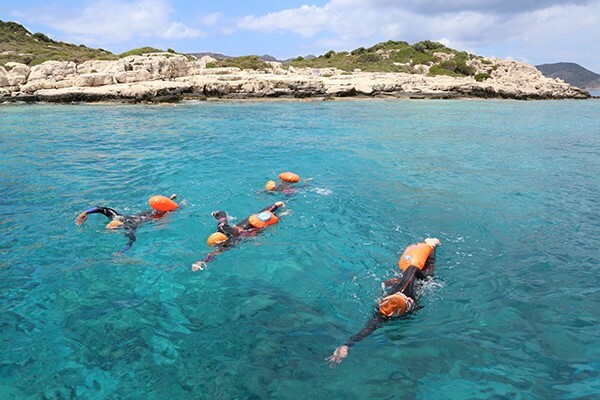 But if that water is so cold to you that you will be swimming in that ‘cold’ water zone, where you are likely to lose attention and control well before the end of the swim segment, then the wetsuit is not adequate protection from this danger. I do not advise that you race in water that your body is not properly adapted to. Wetsuits have different thickness at different parts of the body. Common triathlon suits may use up to 5mm thick neoprene in major zones, and in less important spots and areas (like the shoulders) where more freedom of movement is needed there may be 2 or 3mm or a different material. ‘Speed suits’, though not technically considered thermal wetsuits, may have just 1 or 1/2mm thick neoprene and offer a little insulation for mildly cool water. Keep in mind that black neoprene absorbs radiation heat of the sun. If the water is cool, but the sky is clear and the sun warm, that will improve the warmth of the wetsuit. I know a few people who wear them for medical reasons, like one friend who has only one kidney. Their bodies cool down too easily, even in a normal pool. Wearing a wetsuit allows them to enjoy regular fitness swimming. Wetsuits do add a significant amount of speed. They reduce the surface drag of your skin and make you slide through the water so much easier. It is said that a wetsuit is a leveler – it adds more advantage to a less developed swimmer, while it adds less advantage to one with really good technique and fitness. I have heard some unverified numbers for 1500 meters that a wetsuit could save a novice swimmer maybe 3 minutes while saving an elite only 45 seconds. If you do not prefer using a wetsuit (like me), then that is unfortunate. I don’t know of any races that give special recognition to swimmers who choose not to wear wetsuits. So, that means you suit up and join them or possibly get passed by those who, without wetsuits, would be slower than you. For this reason, triathletes want to wear wetsuits and speed suits even in not-so-cool water, if the race rules allow. Most races have temperature limits over which wetsuits are no longer allowed, and for good reason – getting too hot is the danger on the other side of this water temperature spectrum. If you plan to wear a wetsuit or speed suit that has any thermal value in warmer water, you should also test this out carefully, at the intensity and for the duration of your race to see how it will affect your body temperature. Beware of getting too hot. You want to know what to expect on race day so you don’t have to make a tough decision about your safety under the stress of the swim. If you have practiced and confirmed that you can swim continuously for the full duration and intensity of the race without artificial support to your body (including a wetsuit or pull-buoy), then that is the basic indicator that you are ready for the triathlon swim. You must have this basic no-neoprene fitness in place. 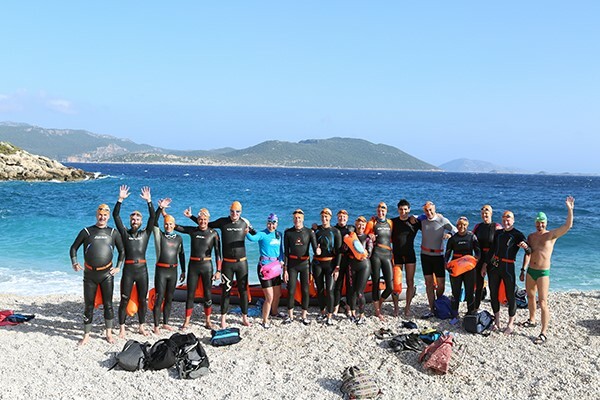 Doing the full triathlon swim in open water, without walls and with lots of people splashing around, will be a big enough challenge for your brain and body – so your ability to handle the distance should not be left in question. I will be a bit stern about this: If you do not have the technical skill, without a wetsuit, to keep your body at the surface and moving forward in water for the entire duration of the swim race, it is not safe or appropriate for you to wear a wetsuit as an artificial buoyancy device. It does not protect you from all the physiological and mental effects of exhaustion and panic that may hit you when you discover you are not capable of finishing the race. This is how novice athletes get into trouble in the swim leg of races. Being unprepared in skill and fitness, then trying to covering it up with a wetsuit is not respectful to the race officials or other competitors, let alone the danger it poses to yourself and the stress upon your loved ones. With that said, if you could finish the race distance without one although it would not be pretty nor fun, you might consider a wetsuit as a temporary support for weakness in technical skill that makes swimming so tiring for you. In this case, though the wetsuit would not be making your swim possible, it would only be making it less tiring so you had more energy for the rest of the race. It is such a wise investment of money and effort to seek out coaching instruction for the skill that removes sinking and struggle from your stroke. In Total Immersion courses worldwide, we’ve been teaching this to all kinds of swimmers, of all ages and body types for nearly 30 years. You can learn to do it also. If you still need to use a wetsuit for warmth and speed, then go for it. You will then have the confidence of a competent swimmer under that neoprene skin. They say you get what you pay for – the more expensive suits often have features that reduce certain kinds of complaints. There is the possibility for chaffing on the skin where a seam or edge of the suit rubs against a moving part of the body. This could be under the arms or around the neck, or near the zippers. The shoulder zone might feel tight and restricting to arm movement. The suit might feel too tight in some sections – making you feel too compressed or restricted. The suit might feel too loose in some sections – filling with water, air pockets, or increasing chaffing. There might be too much buoyancy – the better your technique the less you want the suit to be buoyant. The better the suit fits your body for swimming might mean the harder it is to get on and off. It could be too thin or too thick. A suit that is too thin to keep you warm or too thick and makes you too hot for the water. Also, a thin suit is more fragile to tears from your fingernails when you are prying it on/off. A full-sleeved wetsuit is more expensive, it has more panels to permit mobility, and it can keep you warmer. While a sleeveless wetsuit is less expensive, it creates little or no restriction on the shoulders, but it can permit more cool water to flow into the torso region. There is such a variety of body shapes, sizes, and proportions. It’s really hard to find a suit that fits nicely on a person who has a body shape outside the common dimensions, which most people do! Those who are new to open water swimming may choose to spend very little or borrow a wetsuit. Some races even have representatives there offering wetsuit testing. That is good – so you can get familiar with the advantages and liabilities of a suit before spending more. Be aware of these possible complaints above as you test it out. Just, do not show up on race day with a wetsuit that you have not tried out on the full duration and intensity of the swim you are about to do, unless you are begging for discomfort. An ill-fitting suit will make you uncomfortable in some way. Test everything first, and then there will at least be no surprises about what it is going to be like to swim in this wetsuit for that length of time. I am not going to recommend one. There are many popular wetsuit manufacturers. There are so many different body shapes that don’t often fit conveniently into the manufacturer’s dimensions and molds. First, see what your friends are wearing and ask them to tell you what features they like the most and which cause them some problems. Next, read reviews on this year’s and last year’s models. An online search will bring up many reviews from popular triathlon sites. If any way possible, try on and test a wetsuit before buying. Borrow a friend’s suit, go to a retail store or go to a race where a distributor is offering trials. And, if that isn’t possible, order a suit from a distributor that has a reasonable return policy, so you can try it on once it arrives and just see if it has a good fit. You may even buy a friend’s second-hand suit – though it may likely not be ideal for you, you can get familiar with how it will feel in the water and be familiar with the discomforts that an ill-fitting suit creates. Then, when you are ready to pay for a new wetsuit you will be much more knowledgeable about what you need to look for in your new one. © 2017 – 2018, Mediterra International, LLC. All rights reserved. Unauthorized use and/or duplication of this material without express and written permission from this site’s author and/or owner is strictly prohibited. Excerpts and links may be used, provided that full and clear credit is given to Mediterra International, LLC and Mediterraswim.com with appropriate and specific direction to the original content.